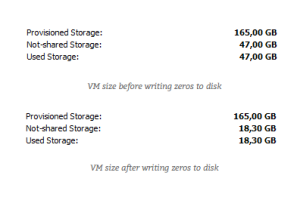 “Since Nutanix presents NFS share to ESXi hosts the datastore level reclaim will not be needed. This left me with in-guest reclamation. Depending on your storage technology, you can reclaim dead space in a VMDK by either writing zeros to the disk and/or running SCSI UNMAP on the unused storage space. This may be all you need to do in order to show the space as reclaimed to your storage controller. Some storage solutions may require an additional step to complete the communication of the reclaim operation to the storage controller. PerfectStorage first analyzes your disk to help you see if a reclaim operation is worth your time. Why spend time and resources on a reclaim operation if the amount that will be recovered is negligible? Then, it produces a report of recoverable space and where it resides (across all disks you choose to centrally manage with PerfectStorage), which allows you to determine whether you want to run the reclaim operation. If you choose to allow PerfectStorage to run the reclaim operation, it will automatically use its Smart Zero Fill feature (or SCSI UNMAP, depending on which reclaim method your storage solution supports) to zero-fill or unmap recoverable storage space without taking your servers offline. The StealthPatrol feature in PerfectStorage runs only while your system is idle, which allows it to run during production hours with no negative impact on system performance. Once the reclaim operation is complete, PerfectStorage produces a report showing you where and how much storage space was recovered. Even better, PerfectStorage can be scheduled ahead of time to run daily, weekly or one time — when it works for you. Again, depending on your storage solution, you may need to complete an additional step to communicate the completion of this reclaim operation to your storage controller. PerfectStorage takes the guesswork out of storage space reclamation, automating a critical (and time-consuming) part of the process, which may be your entire reclaim operation depending on your storage solution. With the right version of VMware you can shrink a VM “on-the-fly” as seen in this video.